This tiny home can actually sleep 7 people inside — check it out! Who says tiny living can’t be luxurious? 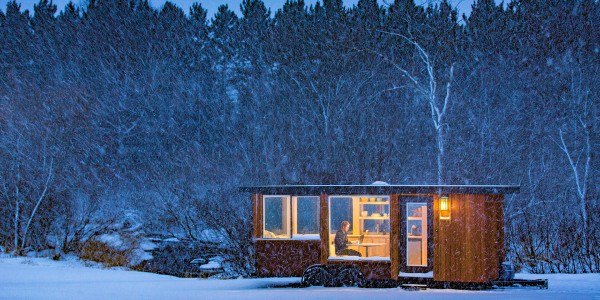 This beautiful tiny home is proof that even the smallest places can give you a big feeling. Created by Handcrafted Movement, a tiny home builder in Portland, Oregon, this 238-square-foot place has a modern farmhouse decor scheme with a luxurious touch: up to seven people can sleep there. A bedroom on the main level can be sectioned off with the simple closing of a sliding barn door. There are also two lofts with an access ladder (that can each hold an air mattress) and a full-size handcrafted canvas and leather couch that can accommodate two guests. In the bright and efficient kitchen, you’ll find gorgeous walnut butcher block countertops, clean white appliances and a built-in dining seat with a capacity for four. The home has hickory hardwood flooring throughout, and the hardware features a mix of brushed nickel, copper and matte black. Even though it’s tiny, there are still plenty of places to store your belongings (although, yes, you’ll probably only be able to bring the essentials). There’s an array of built-in storage cubbies, cabinets and closets, plus a nook with shoe cubbies and coat hooks. And various hanging rod locations are scattered throughout with a capacity for 50 hangers. In the bathroom, there’s a fiberglass shower stall with LED lighting and a Bluetooth speaker, along with an energy-efficient flush toilet and vanity with a stunning round mirror. During the winter months, you can crank up the electric fireplace with a thermostat and cozy up to it or, if you’d rather turn on the actual heat, you can do that, too. If you decide to park your tiny home in a remote place, you’ll probably enjoy the option of hooking up a washer/dryer combination unit. No need to trek too far to wash your clothes. The home is priced at $74,000 and located near Portland, Oregon. To see more pictures and find out more information, visit Handcrafted Movement.